Topic closed. 32 replies. Last post 5 years ago by SergeM. what your looking for is if you have a double or triples ( you don’t care what the numbers are ) right ? You are not looking for the kind of display like 4x2. You used four rows and four columns. You wanted to order the frequency descending. 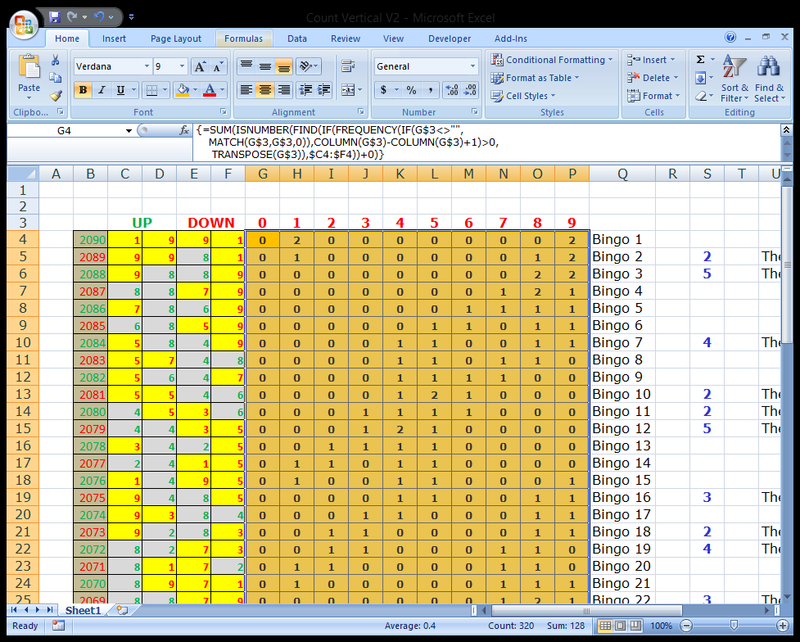 Note that there is a function in Excel that returns the first found most frequent number of a range. You might use percentiles too. Nesting with & allows you to display more data in one cell. Generally you don't want to do that because you would have to split the cell data again. For reading with they eyes this isn't necessary. I have that you are looking for lengths of series, not frequencies. First thing is that you need to step a bit of the "I want this just like that!". Next thing is that you have to build little one row matrices that do little things. You get the information you are looking for out of the columns there. You continue building. Finally you get a result and you show or hide the steps to get there by hiding the columns or not. - The one cell solution is only possible by programming on the backside or you are a wonderboy with matrix functions. - What I showed above is just an extirp of one of my charts that I made around three years ago. - So get your hands dirty, there ain't no free lunch. This formula =SUMPRODUCT(--($B$2:$B$12=F$2),(--($B$3:$B$13=$E3))) goes in the second row,secon column. This is position 1 only, you have to create the other 2 positions.